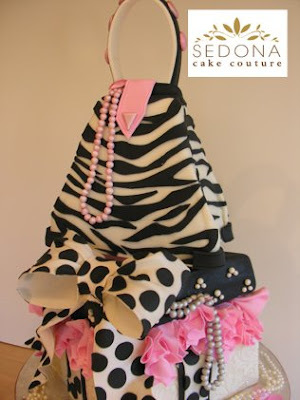 Sedona Cake Couture: Sedona Cake Couture Does More Than Just Wedding Cakes in Beautiful Sedona, Arizona! 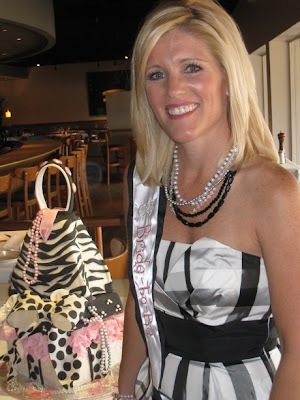 Sedona Cake Couture Does More Than Just Wedding Cakes in Beautiful Sedona, Arizona! Check this out! This is the beautiful Rebecca Francis! And this was the bridal shower cake Sedona Cake Couture made for her shower last weekend. We were told that Rebecca loved black and white! What do you think?!!!! 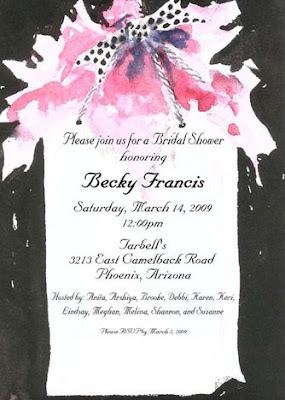 This is the invitation that helped inspire the design! Inside this cake: the "package" was our Signature flavor - flourless chocolate with vanilla cheesecake and ganache with raspberries; the "lid" was our Orange and Chocolate Grand Marnier; the purse was dark chocolate cake with a truffle ganache filling. Every bit of this cake was edible!!! Becky is marrying Keith Galbut on April 25th in Paradise Valley and we have the honor of making their wedding cake. Stay tuned. If you think this is special wait until you see the 5' high cake we will be creating for their wedding - with over 1000 sugar flowers! These are some very unique wedding cakes! I've never seen a cake quite like this one, but it truly is an amazing work of art. Very nice! You're formula for the Orange Cake on the Food Network is really amazing; I even offer it to clients! I hope you dropped off another recipe in the other challenge you did! Love your cakes. this is the cutest cake ever! very creative. Cinderella's Wedding Cake in Sedona!